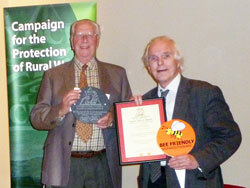 promotion of bee-friendly wild flower displays throughout Monmouthshire”. framed certificate and an engraved slate plaque, on behalf of the group at the AGM of the CPRW on Friday, November 7th at the Shire Hall in Monmouth. The National Chairman of the CPRW, Dr. Jean Rosenfeld, made the presentation. In his short acceptance speech Alan Michie said that the aim of BfM was to redress the decline of all pollinating insects, not just bees. This year, working closely with Monmouthshire County Council, BfM has helped to create stunning displays of colourful, bee-friendly flowers on verges, roundabouts and in public green spaces throughout the county. These have generated great interest and brought an overwhelmingly positive reaction from the public. Alan said there is still a lot to do and our aims for next year include tackling the problems caused by indiscriminate use of insecticides; reassessing the hedge-cutting regime to provide more food for insects and birds in the autumn and winter months; adapting our approach to food production to allow more space for meadow flowers; showing the general public how to provide food and shelter for pollinating insects and encouraging the government to consider the needs of pollinators within their Planning Rules. This entry was posted in Uncategorized on November 11, 2014 by BfM_admin.